We had a very interesting puppy in yesterday. Maggie was here to be spayed, and as a matter of course we always check teeth (and hips) on these youngsters. This puppy had several missing permanent teeth, all of which should have been in place by 6 months of age. The perpetual question is, does this puppy simply not have these adult teeth, or are they lurking under the gums and just have not erupted yet? Some (small breed especially) dogs just never develop some of their adult teeth, which is fine in most cases. They don’t need all 42 teeth to survive. But in some cases the teeth are there and have not come up through the gingiva. When the tooth is developing there is a sac around the crown of the tooth, and this sac is torn away when the tooth emerges through the gum. If the tooth doesn’t go through this emerging process the sac stays around the crown of the tooth, and that’s where problems can start. Fluid collects in the sac, which gradually expands and starts to deform and damage the surrounding bone. This is called a “dentigerous cyst”. 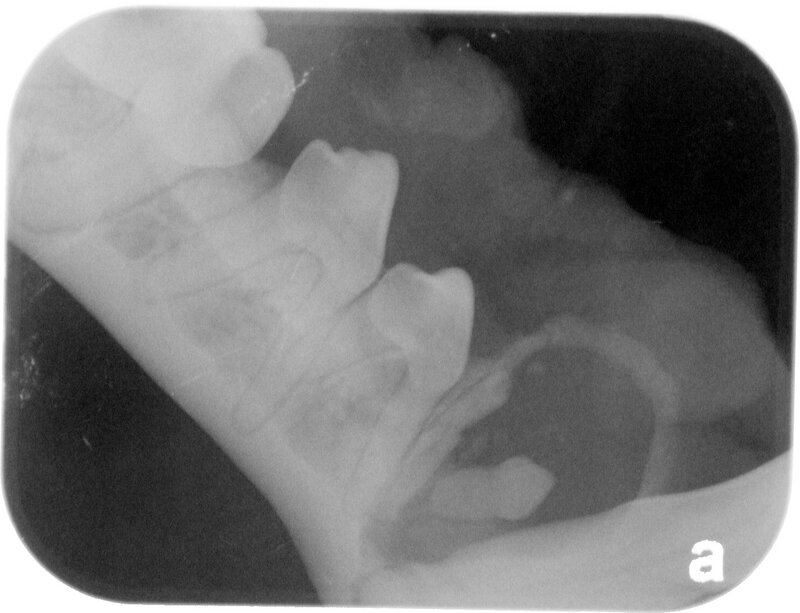 If these cysts are left alone they can destroy so much bone that the jaw can spontaneously break. One molar missing, one lying on its side embedded in bone, with cyst forming. Her last two molars were both missing when we looked in her mouth with our eyeballs. But as we can see on the x-ray, only one really is truly missing, and one is there, lying down like it’s drunk, way beneath the gum and even beneath the bone. More importantly, look at the dark black crescent – that’s fluid accumulating in the sac around the crown, and starting to push the bone away. This tooth needs to be found and removed before it really does damage. Here’s an x-ray of an unerupted tooth that wasn’t discovered until much later. 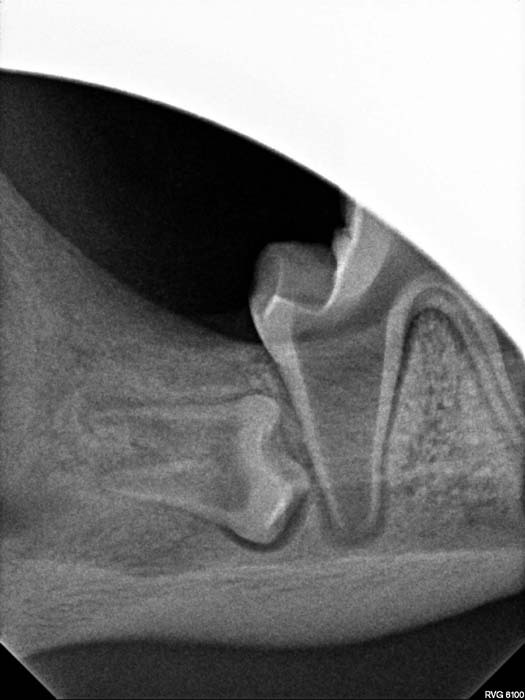 There is a huge cyst around the premolar just behind the lower canine (fang) tooth. Look at the amount of space around the tooth and the amount of bone missing (it should be embedded in nice, light gray bone and instead it’s floating in a black cyst). So if your vet wants to take some x-rays and look for missing teeth in your dog, it’s not just a money-grab. We really need to know. This entry was posted in Animals, Science, Veterinary and tagged dental, dentigerous cysts, Dogs, puppies, Teeth, x-rays by Claws. Bookmark the permalink.